Christopher Robbins, Atlas & Co. An eyebrow-raiser on every page as Robbins reveals remarkable facts and scenes from this huge Central Asian country four times larger than Texas, from the moribund Aral Sea to the new capital of Astana, where you can drink Putinka, a pepper vodka named after Vladimer Putin. I learned more from this book than any other in 2008. Eric Weiner, Hachette Books. Contentment is not Moldova and Weiner tells you why; citizens are happy in seemingly unlikely places like Bhutan and Iceland. If you’re moving to Qatar, think again, according to Weiner’s opinionated and lively reporting Agree? Disagree?. “Bliss” wins the dinner-table conversational-gambit award of the year. William Least Heat-Moon, Little, Brown. The “Blue Highways” author returns to ramble through the countryside winkling out idiosyncracies and semi-eccentrics, proving not all America is strip-malled, franchised, or same-ole. Quoz in other words, defined as “anything strange, incongruous, or particular.” Also truffled in the narrative: good grub joints, travel tips, road lore, and places to avoid. The “My Country ‘Tis Of Thee” book of the year. Justin Marozzi, John Murray. Not only the inventor of history, Herodotus was the first anthropologist, investigative journalist, foreign correspondent, and travel writer. Marozzi retraces the journeys 2,500 years ago of the great man to western Turkey, Iraq, Cairo, Egypt’s Ammon near Libya, and finally Greece. With stops at a Turkish nightclub and gay marriages at the Egyptian oasis. John Gimlette, Hutchinson Books. In 1944, platoon commander from Boston Putnam Flint landed in Marseilles and helped push the Nazis out of Alsace-Lorraine, back into Germany, then continued his war into Austria. At age 86 Flint revisited his battles with author Gimlette, from spectacular landscapes to cities risen from ashes. Result, a fine hybrid of travelogue and personalized military history. Gregor Dallas, Walker Publishing Co. Not a history of Paris’ Metro but what you find near twelve Metro exits: memories of Camus/Sartre at St.-Germaine-Des-Pres, Emile Zola at Chatelet-Les-Halles, Anais Nin at Trocadero, Claude Debussy at Opera, and fittingly, the final stop: Wildean stories of Oscar at Pere Lachaise cemetery. 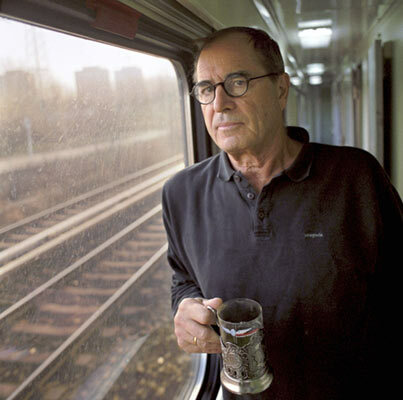 Paul Theroux, Houghton Mifflin. Half a lifetime later, our premier writer of railway travel retraces his “Great Railway Bazaar” route of the 1970's, skipping this time Iran and Afghanistan for obvious reasons. As in all Theroux’s travel books, the real gems are people met along the way, especially in this wistful journey of “the seim anew” as James Joyce put it. Michael Moran, Granta Books. Soon after the fall of the Soviet Union, Moran arrived in Warsaw to help introduce a Polish company to the “joys of the market economy” as a product manager. The venture failed but Moran turned his trip into a cultural exploration of Poland as it adjusted to change. And he found a wife along the way, perhaps partly because of his gorgeous old Rolls Royce touring car. Tiziano Scarpa, Gotham Books.On the map it’s only seven kilometers by four and indeed is shaped like a fish, this unique and beautiful of world cities. Scarpa knows it intimately and has the patient, attentive eyes capable of registering the details you might miss no matter how many visits. The dining chapter (“Mouth”) is worth the book alone. Scott Huler, Crown. Author Huler at age 44 and an expectant father felt the need to retrace another middle-aged man’s heroic journey homeward after the Trojan War through the Mediterranean Sea. Unlike Homer’s account of Odysseus’ journey, Huler also learns life lessons from his travels but fails to tell us why he always travels with a pocket-size kite…perhaps the travel tip of 2008.